Meet the flame jellies! Buy tickets online and you won't pay any service charges. The newest arrivals in the Jellies Exhibit are called flame jellies (Rhopilema esculentum). 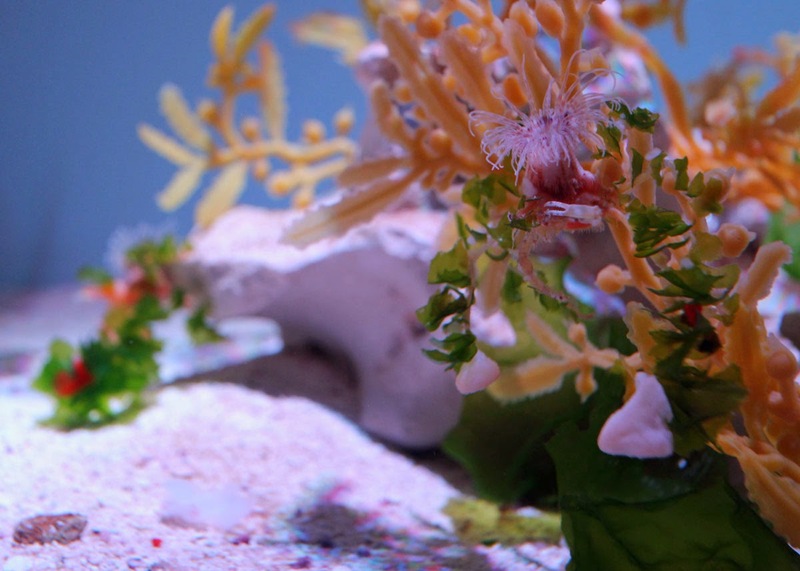 Looking at their reddish tentacles it's not hard to imagine how they got that name. These stunning animals came from Chicago this past winter after the Shedd Aquarium's special jellies exhibit closed. It took the aquarists in Boston and Chicago several attempts to coordinate the transport around snow storms and Arctic blasts. A behind-the-scenes tank let the flame jellies slowly acclimate to the Aquarium's water system during their quarantine. Finally they arrived on an overnight flight, where the jellies were whisked into special kreisel tanks behind the scenes for a routine quarantine period, giving them time to slowly acclimate to our water systems. About 25 jellies went into the exhibit this week and they seem to be settling in beautifully. This species lives for only about three months. But there are some polyps and very small medusae growing behind the scenes. The aquarists are hopeful they can grow more of this species for the exhibit! [Polyps? Medusae? Get a primer on sea jelly reproduction.] 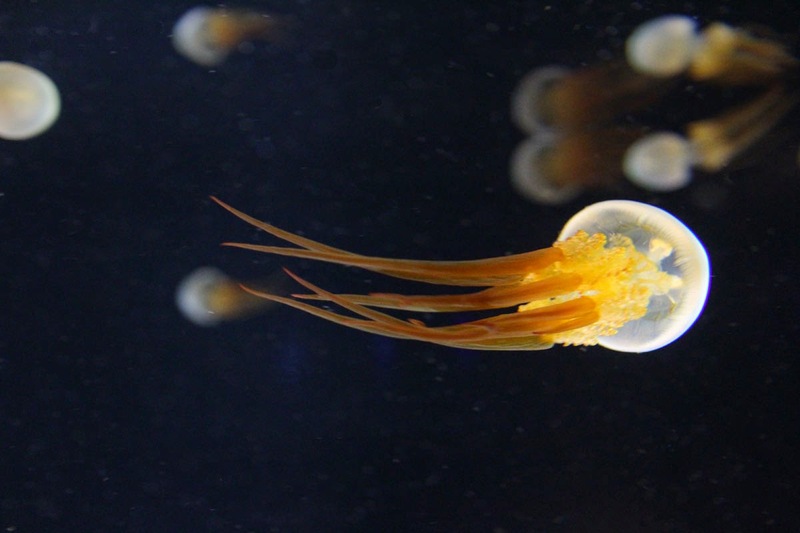 Interestingly, flame jellies are also raised in China for commercial aquaculture. Look for them on the menu at your local Chinese restaurant! 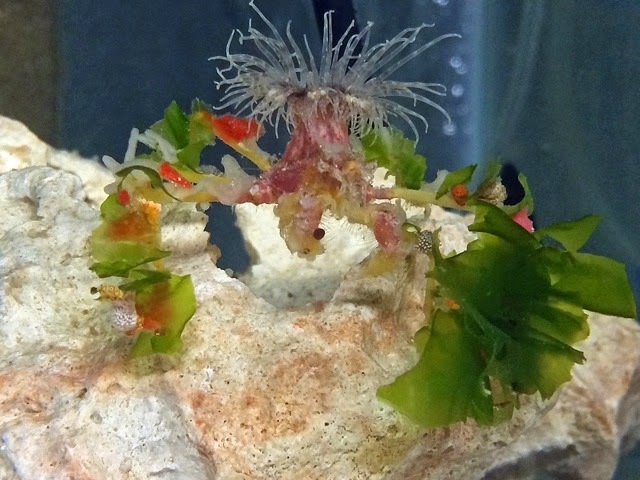 You might have overlooked some of the newest residents of the Yawkey Coral Reef Center, and that's just how our new decorator crabs (Podochela sidney) like it. 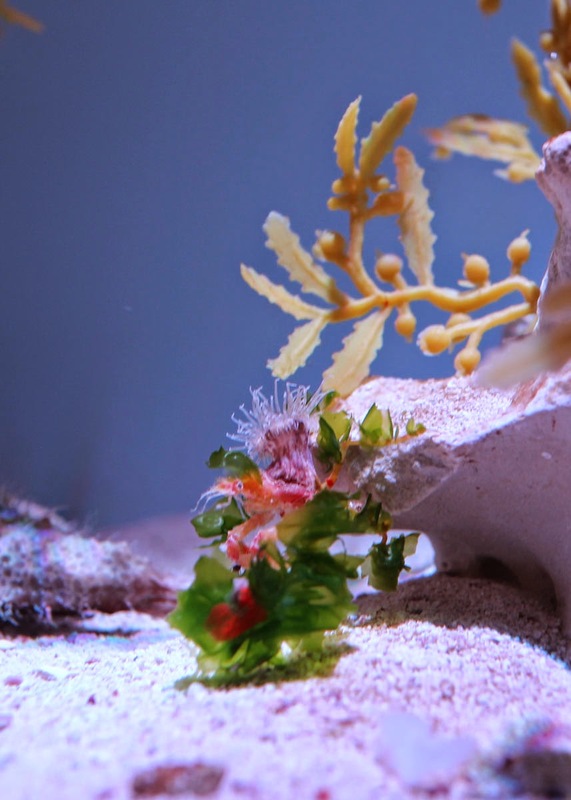 You see, these delicate crustaceans cover themselves with elements found in their environment—like seaweed or sponges or even little anemones—so they blend in. 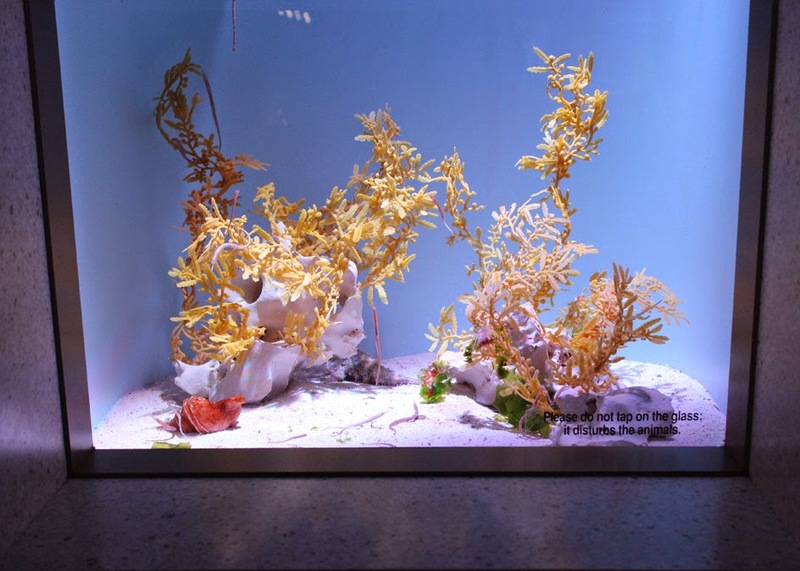 This compact exhibit features two decorator crabs, a purple spotted shrimp, several juvenile pipefish and a spotted batfish. Can you spot the decorator crabs? Here are some clues to help you find these guys hiding in plain sight. They're only a couple inches from leg to leg. 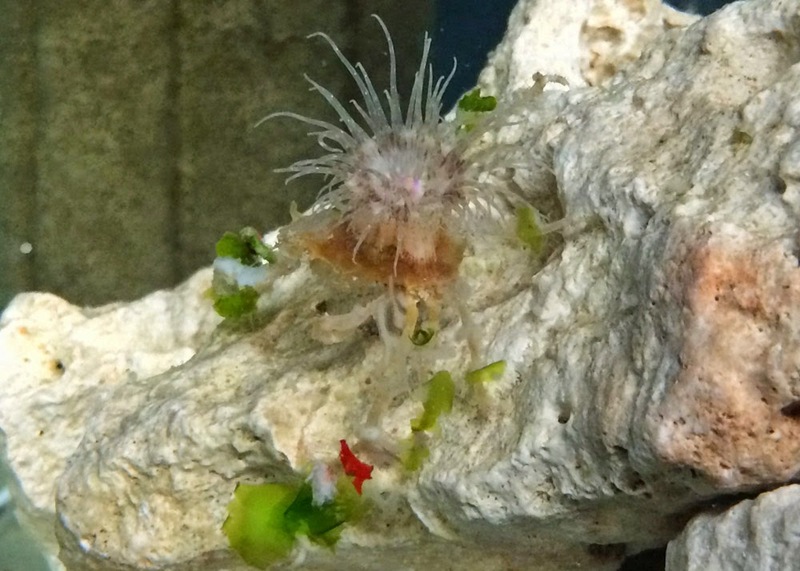 There's a pinkish anemone growing on each crab's back. They have also collected pieces of algae and affixed them to their spindly legs with the help of tiny spikes that act almost like velcro. At the end of one crab's legs, it has attached hunks clam overlooked by the resident batfish—mmm, tasty. Here's a close up look. Can you see it now? The crab is holding up one of its claws, the second crab is out of focus in the background. But these crabs didn't always looks so green and ruffly. They arrived with a much different aesthetic based on their previous habitat, which was dominated by orange sponges. 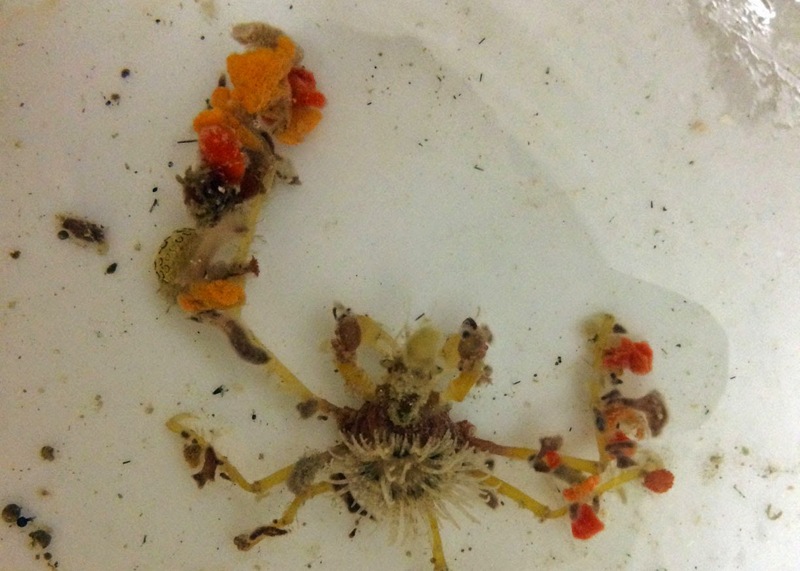 The disguises attached to the crab's legs were mostly chunky bits of sponge. Like all new arrivals at the Aquarium, these crabs had to go through a brief quarantine period. During this time they started to shed their old look and incorporate bits of their new surroundings. This species of crab is native to the Caribbean. It lives in coral reefs at 10 to 30 feet deep. Each one can grow nearly 4 inches from the tip of one long, thin leg to the other. Underneath all that flare, these decorator crabs are a beige to reddish color. Now on exhibit, you can see these handsome crustaceans in all their festive attire! 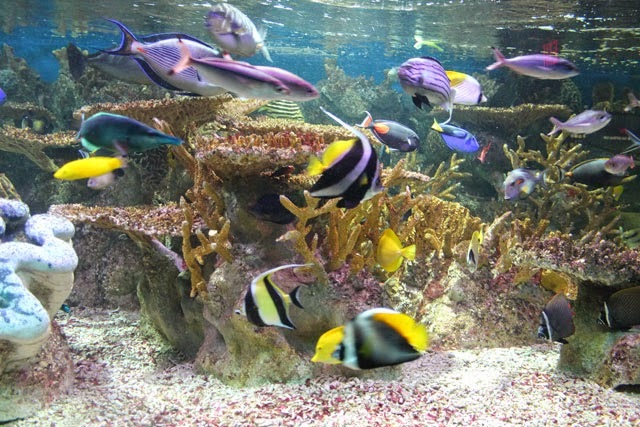 Meet some other residents of the Yawkey Coral Reef Center and around the Aquarium! Stay warm. Visit the tropics. There's never really a bad time to visit the Aquarium. But when Arctic winds gnaw on your cheeks and salty sidewalks crackle underfoot, retreating inside to the warm-water tropical exhibits at the Aquarium is divine! Here's just a smattering of the residents to seek out. 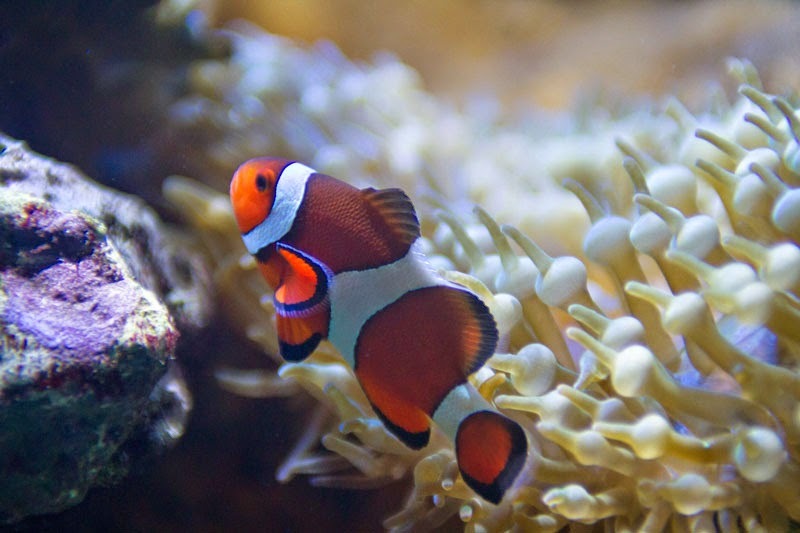 Pairs of clownfish in the Living Corals exhibit stake claim on an anemone home. They's also a pair in the Pacific Reef Community. 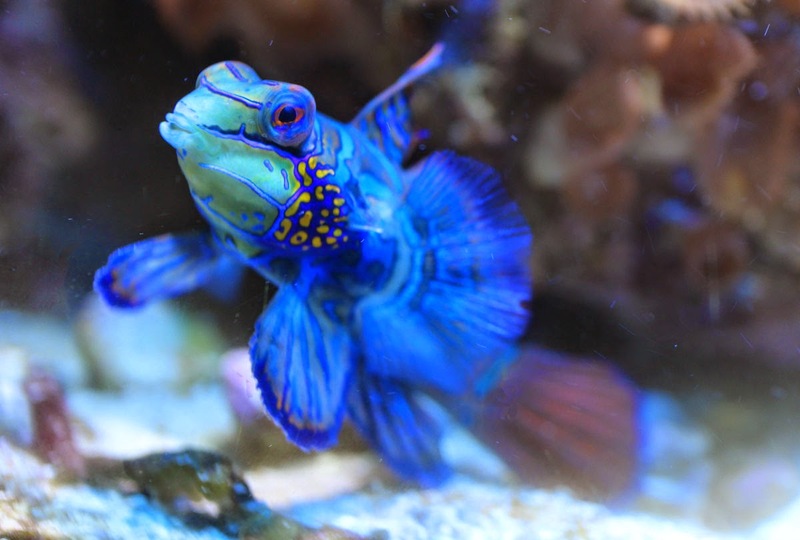 There are two mandarinfish in the Living Corals exhibit. 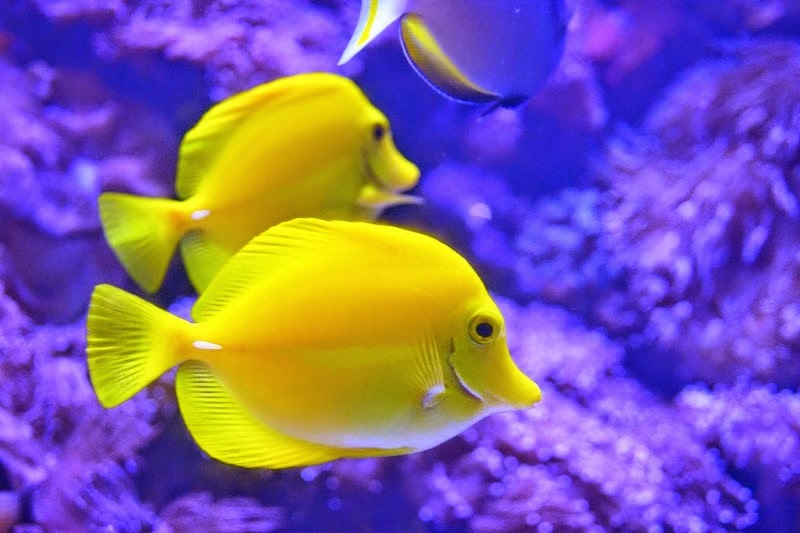 The Pacific Reef Community is ablaze with sunny colors and lots of activity. 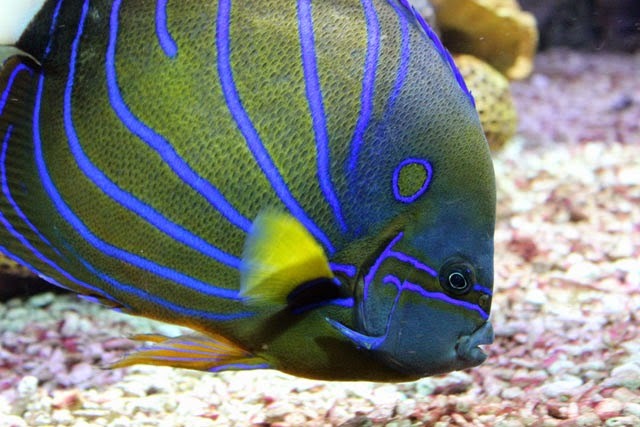 The bluering angelfish is among the larger fish in the Pacific Reef Community. 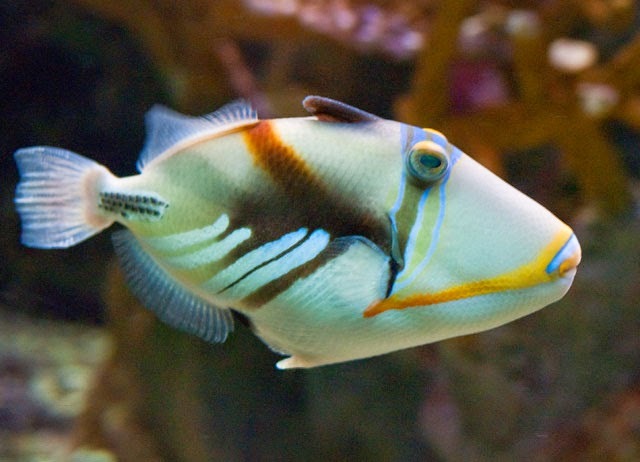 This resident of the Pacific Reef exhibit has many names: lagoon triggerfish, Picassofish and humuhumunukunukuāpuaʻa. and the tropical tank across from the shark and ray touch tank. 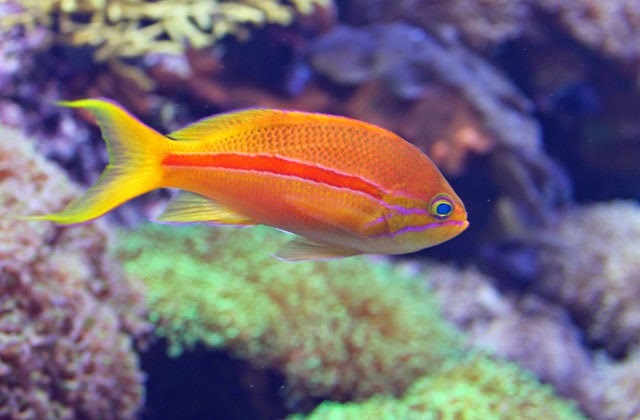 Anthias are found in the Pacific Reef Community and the vibrant tank across from the shark and ray touch tank. Our divers have also spotted this species in the wild.